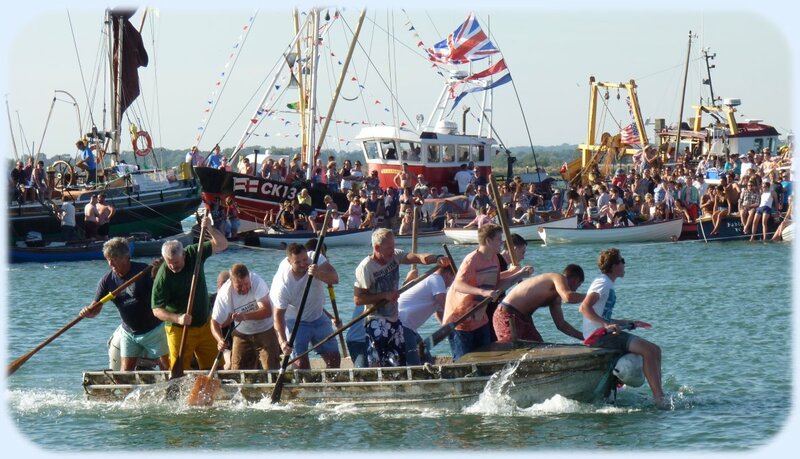 West Mersea Town Regatta takes place on Mersea Island in Essex, and has been running since 1838. 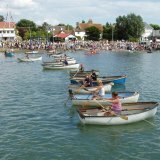 The Town Regatta is run by a hard working voluntary committee and although it is usually held at the end of Mersea Week, has no connection with other clubs and is entirely self-financed. Photos of the last Regatta may be seen on the events pages from the menu on the left. The Cobmarsh Marathon takes place before the main Regatta and in 2019 is on Saturday 3rd August. The main Cobmarsh event is a pair-oared Rowing Race around Cobmarsh Island, followed by several more light-hearted rowing races. There is a Prizegiving and social event in the evening. On Saturday 17th August 2019, the Sailing Races start Regatta Day events. The first start is at 0900 hrs with about 100 boats taking part, split into 7 different classes. 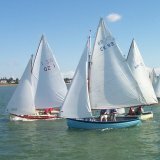 Entry Forms for the sailing events are available in the Regatta Programme and from this website and must be handed in to the West Mersea Yacht Club. a Swimming Race and the ever popular final event is 'Walking The Greasy Pole' which is rigged over the side of the Thames Barge Committee Boat. Entries for the Watersports are free and entering is not required - just be on the start line. Refreshments and RNLI Souvenirs at the Old Lifeboat Station. The Regatta Emergency Contact Point is the Old Lifeboat Station situated at the bottom of Firs Chase. A Grand Firework Display takes place at 9.00 pm. Please give generously to the bucket collection, as this is the only funding for the display. A friendly 'Coast Road Evening' social event is held in Peter Clarke's Shed with the Poachers. Details of tickets may be found in the Regatta Programme.